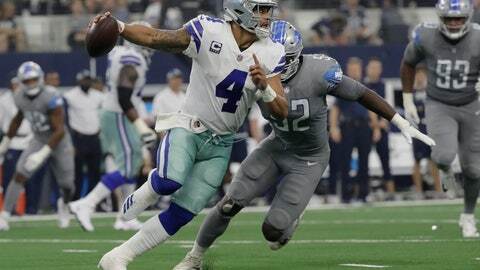 ARLINGTON, Texas (AP) — Dak Prescott looked a lot like the NFL Offensive Rookie of the Year from two seasons ago in the Dallas Cowboys‘ win over the Detroit Lions. Before his decisive 34-yard throw to running back Ezekiel Elliott behind the defense to set up the winning kick, Prescott saved the final drive by scrambling backward to pick up his own fumble and throwing an incompletion to preserve a manageable third down. He converted it. NOTES: Coach Jason Garrett said receiver Terrance Williams will return to the team Tuesday after an excused absence going into the weekend. The sixth-year receiver was inactive for the first time. … Executive vice president of personnel Stephen Jones said Elliott was battling bursitis in one of his knees along with an ankle injury. Garrett said his practice participation would be determined during the week.